The ASA claimed the campaign to falsely advertise benefits of the makeup. Three guesses which image is airbrushed. Flip through the pages of any fashion magazine and you're sure to see impossibly smooth skin and flawless faces. But for our neighbors across the pond, airbrushing can go too far. Jo Swinson, a parliament member from the U.K., said that recent Lancôme ads featuring Julia Roberts and Christy Turlington are false advertisements. While the foundation promises to reduce wrinkles, the images were so retouched that there’s not a crease or blemish in sight. The ASA made L'Oreal pull both campaigns from the U.K. According to the Guardian, the ASA wasn’t able to see pre-production photos of Roberts due to contractual agreements with the actress. 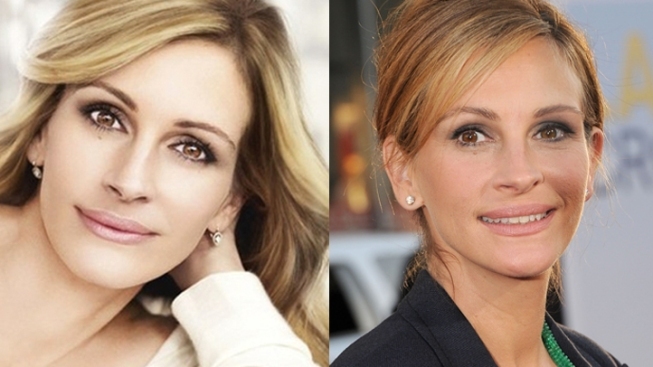 Julia Roberts and Christy Turlington--who are both quadragenarians—have no doubt aged well, but not well enough that they are free of fine lines and other factors that in fact reveal actual signs of being a human.